Attendance Attending weekly club meetings allows members to enjoy fellowship, enrich their professional and personal knowledge, and meet other business leaders in their community. Service By participating in local and international service projects, club members can volunteer their time and talents where they’re most needed. 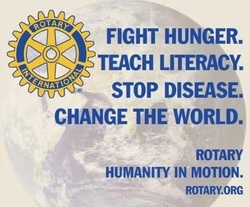 Finding and keeping members - To keep clubs strong, every Rotarian must share the responsibility of bringing new people into Rotary. Even new members can bring guests to club meetings or invite them to participate in a service project. Dues Club members are required to pay annual dues to their clubs, districts, and Rotary International, as well as the subscription fee to the appropriate Rotary magazine. Leadership Club members are encouraged to volunteer for leadership roles at the club level and beyond.